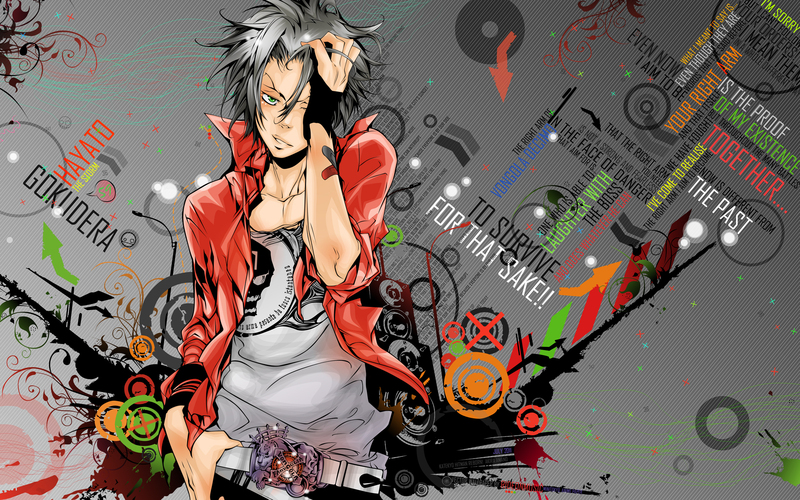 Finally finished the Gokudera wall from my vector. What took so long was I had no idea what to do for the background. So I decided to do some random abstract vectors and it somehow turned out like that... The speakers were vectored from this scan and improvised... Everything was vectored by me without using brushes, with reference to some images I found on google. I ran out of ideas for the top right corner so I decided to fill it up with text- It is a quote said by Gokudera. yes, my intention was for it to be messy like.. with random doodles etc.. like a sketchbook. Ohhhh love this wall! I love the combination of colors! Thanks so much for shared! I think this wallpaper takes to do it a lot of time...Great! dude! oohhh... you finally made a wallpaper out of your vector! I must say nice typography, especially those on the right side. but I find the wallpaper somewhat messy especially since there is those stamp-like things/ pictures at the upper left and the lower right... Its design doesn't jive well for the typo. I think it would be better without them and just pure different styles of typo. That way it'd look funky and cool. But all in all nice job! FUNKY! and you already walled this gorgeous vector of yours. the typography is very creative as well as those other figures you vectored. Awesome background! so many details.. its mostly grey but yet so colourful. Your vector is perfect too^_^ Amazing! As for the BG, I think it looks somewhat weird. I like the typography, it's very neat and fitting but the things in the corners are kinda distracting. I like the combination of gray and colors but as Trofi pointed out - there's too much of it in the wall and the way you filled the corners does look a bit distracting; it takes away the focal point from Gokudera. I'd suggest to leave the corners free of typography and design and to just leave the central design in the middle. Keep it up! Hayato is so hot here and I like the really bright, lively and colorful background! Looks so funky, though yeah, I agree with have been said about the messy background, even when you have taken out stuff already. I'd have to say that floral design doesn't fit the overall concept, since it's too organic for the background. Lol, and actually I think that if you had made the background using mainly the stuff on the second revision, like the skull, speaker, etc, it'd have fit so much better. The text, on the other hand, it's absolutely great!